Smokers who successfully quit feel less anxious afterwards - despite the belief that smoking relieves stress, researchers say. The British Journal of Psychiatry study followed nearly 500 smokers attending NHS stop smoking clinics in England. 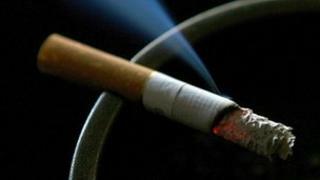 It found a "significant" decrease in anxiety levels among the 68 smokers who had quit after six months. The effect was greater among those who had mood and anxiety disorders than those that smoked for pleasure. The researchers - drawn from several universities including Cambridge, Oxford and Kings's College in London - said the findings should be used to reassure smokers attempting to quit that concerns about increased anxiety levels were unfounded. However, the study did suggest that a failed attempt to seemed to increase anxiety levels by a modest degree among those who had mood disorders. For those who smoked for pleasure a relapse did not alter anxiety levels. The researchers said it seemed that smokers - particularly those that smoked to cope - were more likely to have a cigarette soon after waking up to stave off withdrawal symptoms, which include anxiety. By quitting, they removed these repeated episodes of anxiety and felt less anxious as a result, they added. It comes as the government has launched a graphic anti-smoking advertising campaign, which features a cigarette with a tumour growing from it, and as many smokers prepare to quit as part of their new year resolutions. Smoking: Can the nation kick the habit?